The village's name is derived from 'valley of a man named Granta or Grante'. It was spelled Grantandene in 973 and Grante(s)dene in the 1086 Domesday book. Woodland was important in the settlement's early history; there was enough to support 60 pigs in 1086. By 1251, a large area of woodland in the south-east of the parish had been split into Hayley Wood and Littlehound Wood (the latter no longer exists, but the shape can still be seen in field boundaries). 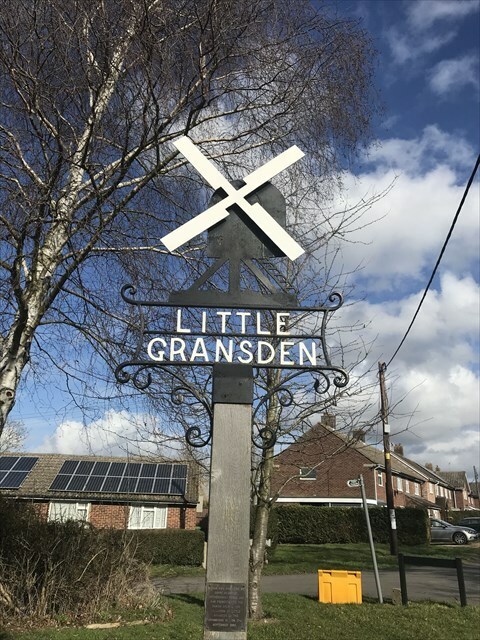 This sign was made by Barry Keightley, Fotheringhay Forge and was presented to the parish council and villagers of Little Gransden by The Gransden's WI on the 17th September 1983. It looks like the village sign used to be down near the local hostelry but it has now been moved up here.